“The Thrower Of Knives – #6” submitted by Flore, the photographer. 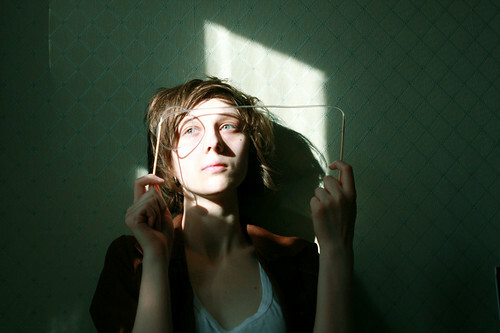 The model is Margaux Duroux. Alex Hartley, originally uploaded by www.elliott-morgan.com. Recently the whispers regarding my gender (or lack there of) have ceased to be flattering and started to make me feel anxious and uncomfortable. I can’t hold a conversation with anyone because they’re more preoccupied finding out “what” I am instead of what I have to say. It’s gotten to the point where it’s the first thing I worry about in the morning, and the last thought in my head at night. How can I get myself to stop focusing on this outside judgment? I identify as… a person that is generally confused… in my mind i’m a boi trapped in a female’s body. 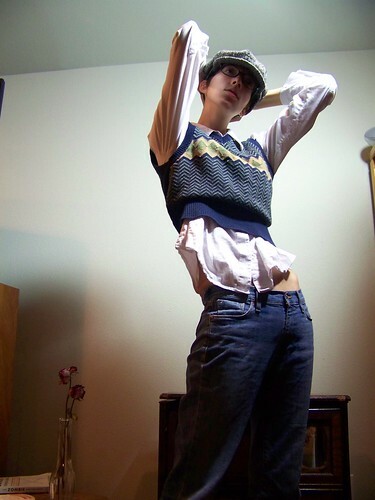 in life i’m just different: that girl that dresses in boy clothes and unsuccessfully tries to bind her chest. i’m gay and me and i hate labels. I’m attracted to… im attracted to females… genderqueers… um i don’t really have any feelings towards biological males… and i haven’t had that much experience in other people… i love everyone that loves me! When people talk about me, I want them to… understand that i am sensitive. i may seem crazy, stupid, and weird on the outside, but i’m really just a person. a creative soul trapped in a body. i am 16, currently a senior in high school. i’m a writer and currently have a blog and vlog that i don’t really update. you can find me on facebook (“jay banks”) and on blogger: pandab-g.blogspot.com. search johnathan1330 on youtube and you might find me. Regender.com “translates” web pages by switching gender words. What would the world look like if the two sexes switched places? What would it look like if English had genderless pronouns? What would it look like if English identified races the way it identifies gender? , originally uploaded by bee_xlaura. I identify as… a mixture between feminine and masculine, and I identify as beautiful. As far as third-person pronouns go, … I suppose female ones. I don’t really think about it much. Most people can tell I’m a girl. I’m attracted to… intelligence. Open minds. Eyes. Breasts. Hips. Men. Women. My boyfriend. When people talk about me, I want them to… realize that how I might behave in one situation is not how I am all the time. I want people to understand… that people who have autism or aspergers syndrome are a part of the queer community, and it’s still way under-represented. My name is Lacey and I’m going to school for an english-writing degree. I hope to be a creative writer and a librarian. I mostly write poetry about my experiences as a bisexual woman. IMG_5081, originally uploaded by stripped. I always get a small surge of anger when faced with a tick box that says M / F. Last time I just didn’t tick anything. I wonder what the recipients of the form thought. Del LaGrace Volcano asks Londoners for insight about their genders. duo, originally uploaded by mord. I’m a VERY curvy and short female-bodied genderqueer who looks great in women’s clothes, but for those days when I want to look androgynous or butch, I’m lost. Where do I find androgynous-style clothing for short, curvy people? Have You Seen The Blind Man? Diner en famille, originally uploaded by JiPi MaStA. My gender isn’t complex. It only becomes complex when I try to explain it in terms of the binary. When people talk about me, I want them to… talk about me as a human and not pertaining to the gender binary. I want people to understand… there is far too much that i wish people could understand…but i guess i’d be super happy if people realized that this world is not and never will be black and white… there will ALWAYS be shades of grey. I have a few different names to a few different people, but most everyone calls me Locke. I’m an art student living in LA, and generally the culture here is open-minded and willing to accept me. I’ve even had the luck and pleasure to stumble upon several beautiful persons whose identities lie in or near the same pool as mine. Still, i’m trying to discover exactly who it is that i am and who it is that i’m meant to be… like everyone else in this shiny world, i’m floatin’ along and picking up bits and pieces as i go. I love puppetry and rain and apples and talking and makin’ new friends, so hit me up! , originally uploaded by ray the myth. This is a somewhat long, but quite interesting, article written by a pansexual semi-cisgender woman about her struggles with her own gender identity, her relationship with her FTM partner, and the ways in which gender expresses itself in our subconscious. She discusses the ways in which gender is just one of many characteristics which differentiate us, and explains that to her androgynous sensibilities, it’s a rather insignificant characteristic. “Feel like a Gentleman…” submitted by Elena, the model.